Your products are on the LibDib platform. Congrats! You now have wholesale distribution and your products are searchable and presented beautifully to buyers all over the state. However, just because they are there it doesn’t mean the stuff will sell itself. This is also the case with pretty much every wholesaler out there. Salespeople at traditional distributors have so many products to push that they pick and choose those that they are incentivized to sell. The products from the largest producers are most important to the distributors’ bottom line. Makers need to have a go-to market plan. Whether it’s a broker, a sales person/team, a marketing company, or just straight up making your own appointments and hitting the pavement…. you still need to sell. And this is the case if you were to get picked up by any wholesaler out there. Gone are the days of wholesalers “dragging the bag” for every brand in their book (or even half of their book). Consolidation has made it literally impossible to do that. They just have too many brands. 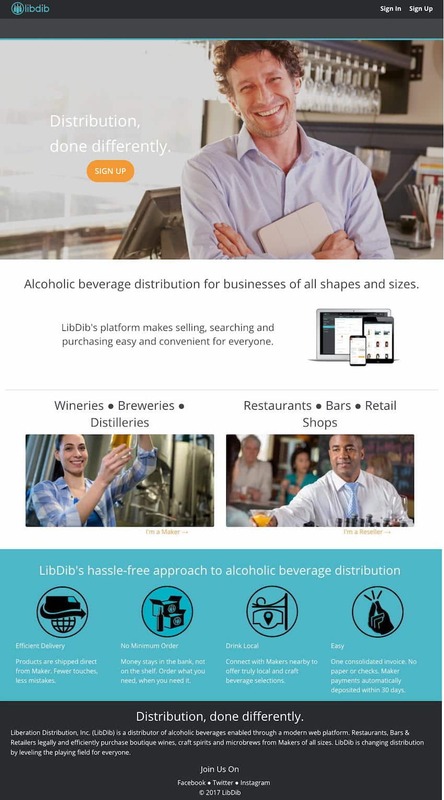 However, LibDib’s platform is an amazing tool to help jump start your market visions. And we have some very cool products launching on the platform soon to help (more about those later). 1. Make your storefront awesome. Spend some quality time on descriptions, key words, recipes, etc. Link to your videos and social media accounts. Add all your POS and sales materials. Put up beautiful, personalized pictures of your property or brand. Try some video tasting notes of your products. Create video (even just from your phone) of vineyards, stills, bottling. Tell your story. 2. Start reaching out to restaurants, bars and retailers about your products. It doesn’t matter whether they are on the platform or not; there is no cost for buyers to utilize LibDib and it is very easy and intuitive for them to set up an account. You can email your contacts, utilize social media to get the word out and put the LibDib logo and link on the “Trade” section of your website. Buyers like the idea of LibDib because it is easy to use, has lots of selections and doesn’t require a huge purchase for minimum delivery. We have sales materials we can send to you (both electronic and printed) that will help accounts get on the platform. Email us! 3. LibDib has accounts visiting the office regularly. Send us samples to display and we can taste your products with them. We will also take pictures, post on our social media and potentially curate for digital marketing purposes (via push emails to buyers). A note about this: LibDib creates content for marketing purposes based on products that are being sold on the platform. This is a necessary part of our marketing plan and brings buyers to LibDib. However, products will be chosen for these marketing messages completely autonomously (i.e. nobody can “buy” placement or have preferred messaging based on the size of the producers). 4. Create “packages” that incent buyers to try your products. Mixed cases (call us about that; it’s tricky because of ABV, but it can be done) or 3 and 6 bottle packs. Give your buyers the opportunity to buy small and keep their money in the bank rather than on the shelf. Again, that delivery minimum thing. 5. LibDib is planning trade tastings in each market later this year (Fall) for holiday buying. Plan to be there (dates announced soon-ish)!